3 biros. 2 passports. 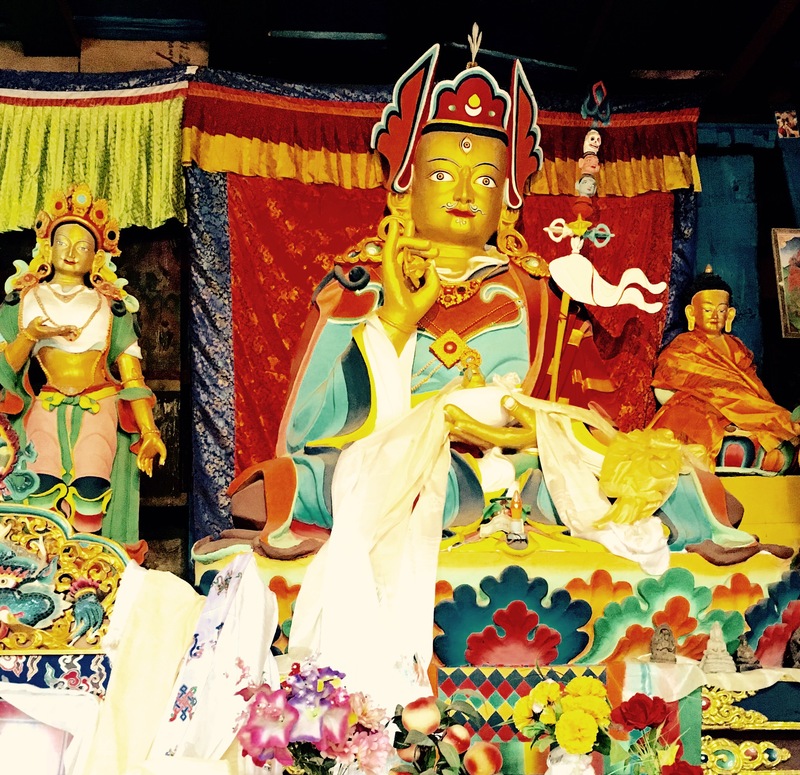 One foreign editor's meandering Asian voyage home. Hands grip seats and hearts beat a little faster as two motorised propellor engines drone with effort. 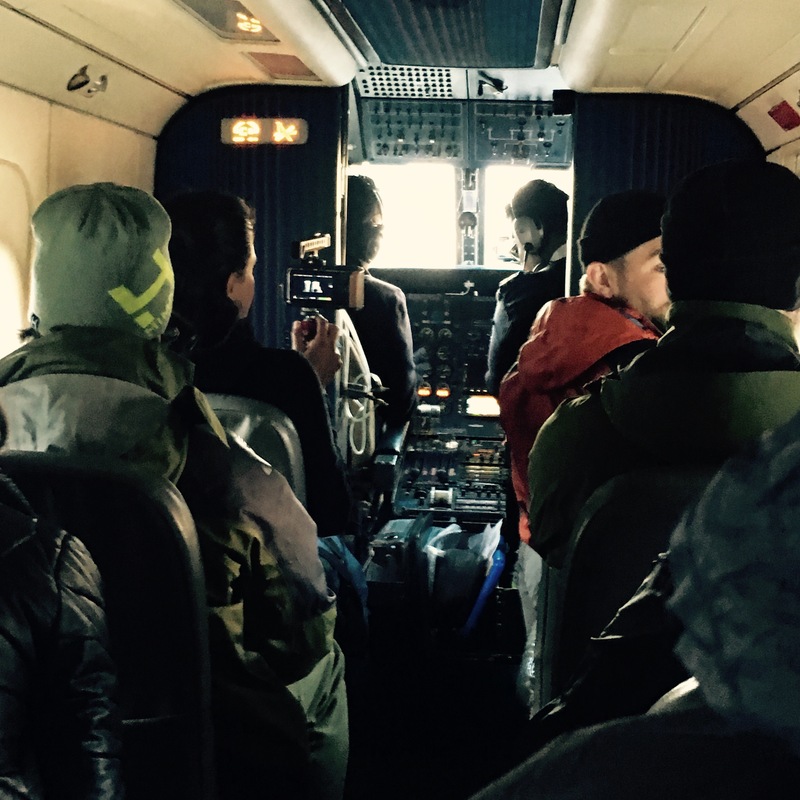 Passing the ridge of a sharp peak, the pressure drops as the small 12-seater pierces the clouds and comes in to land at Lukla airstrip, one of the most perilous and isolated runways on earth. 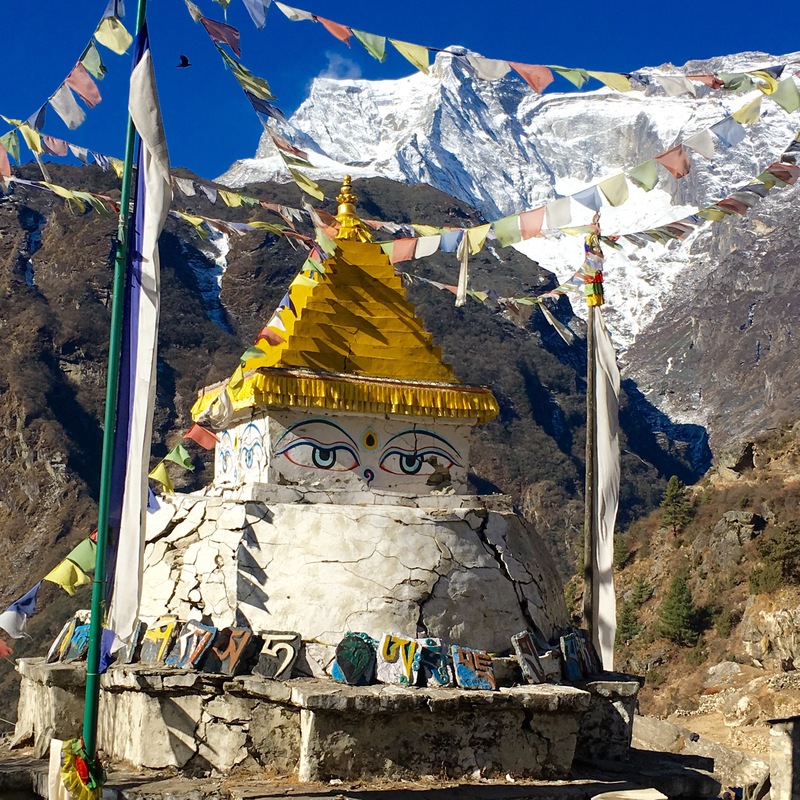 Gateway to mighty Everest and the high Himalayas, intrepid trekkers in search of an elusive adrenaline rush brave the altitude and the elements, beginning the long weeklong hike upwards. 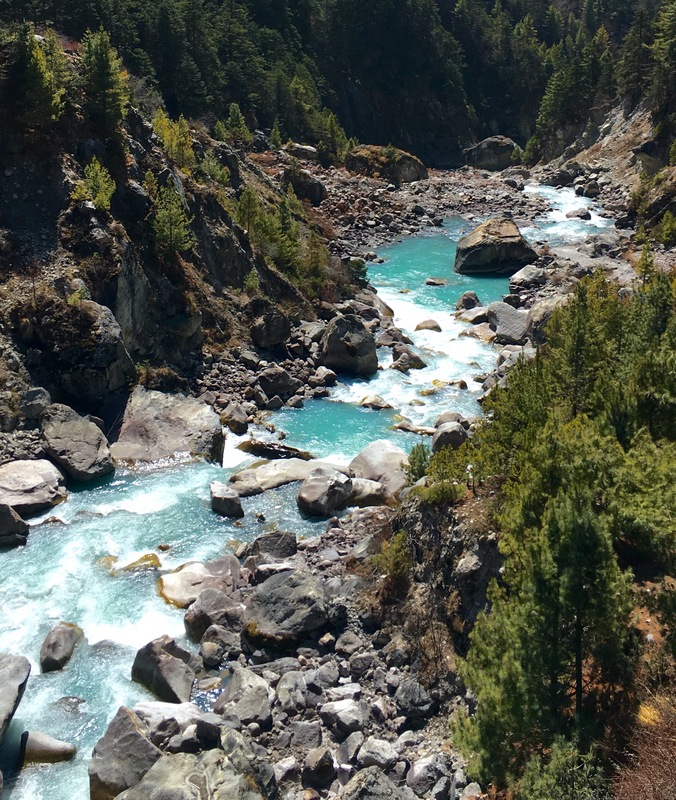 Passing stony crags, virgin pine forests, turquoise rivers and small villages, simple wooden teahouses offer hot masala tea, spicy dal bhat curry and shelter. The ring of yak and jokyo bells together with the rushing of clear mountain streams provide the only other soundtrack to the steady, slow pace of trekkers’ footsteps. 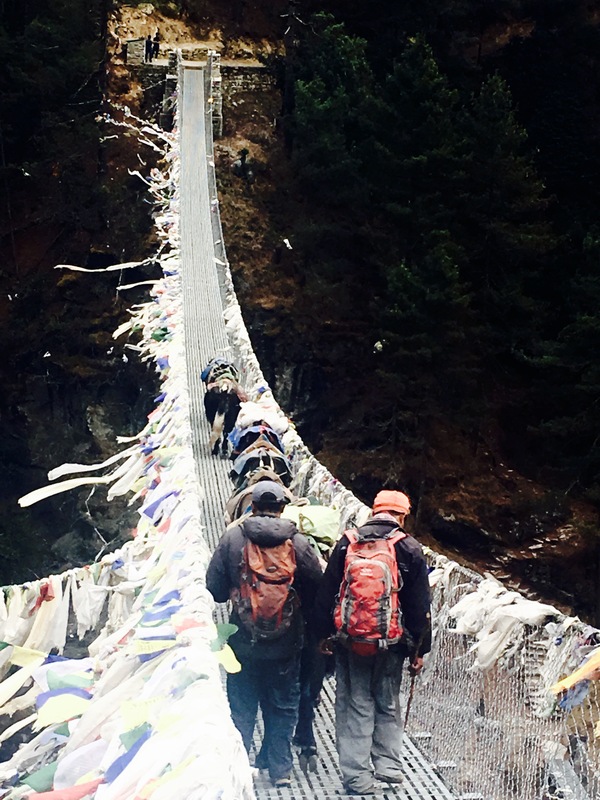 Ascending higher, the wind whistles, flapping row upon row of prayer flags strung across wire suspension bridges. 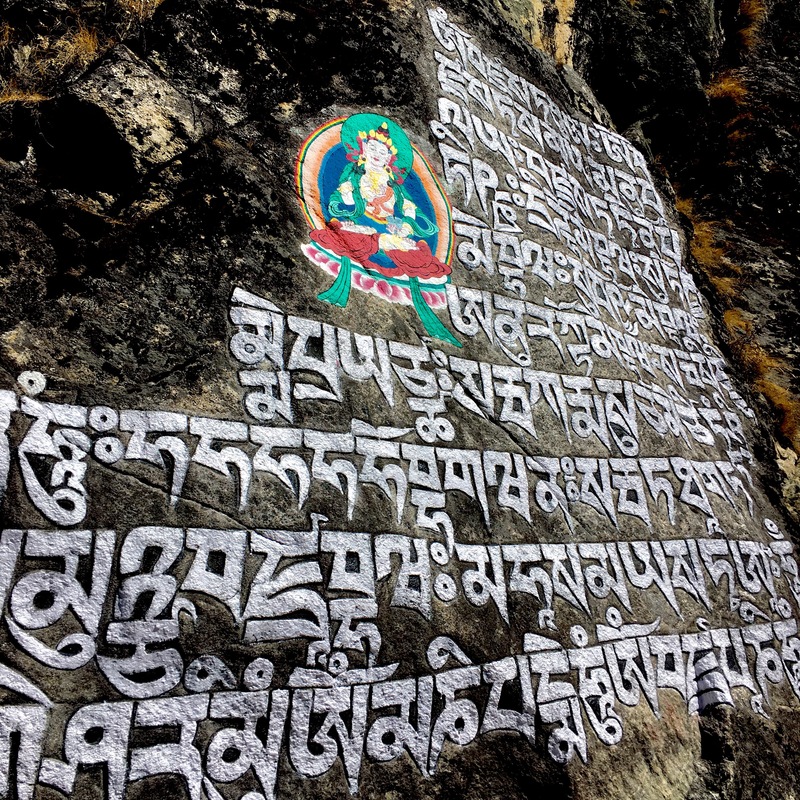 Rocks engraved with Buddhist mantras line the route. “Om mani padme hum” chants my guide Saroj, asking for protection from the Buddha of compassion for those like us venturing into the capricious mountains. 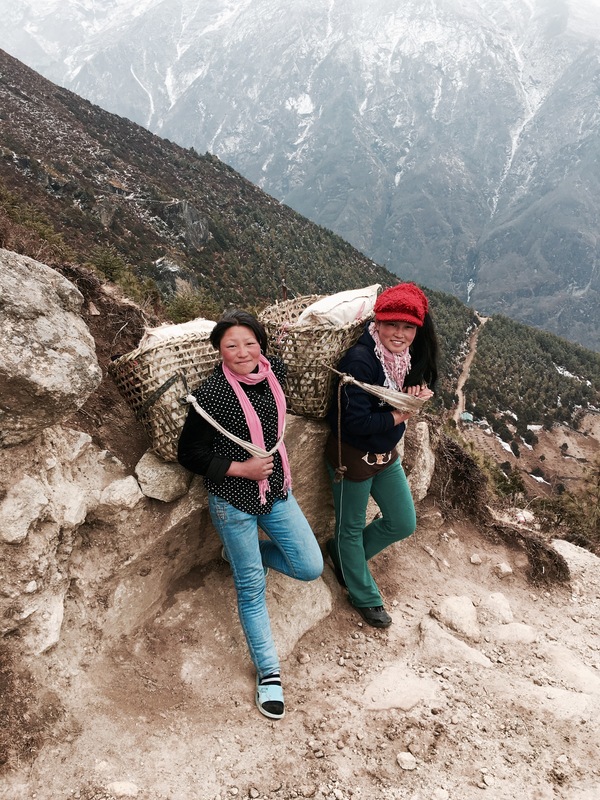 Ethnically Tibetan, the local Sherpa people still practice this distinctive form of Buddhism. 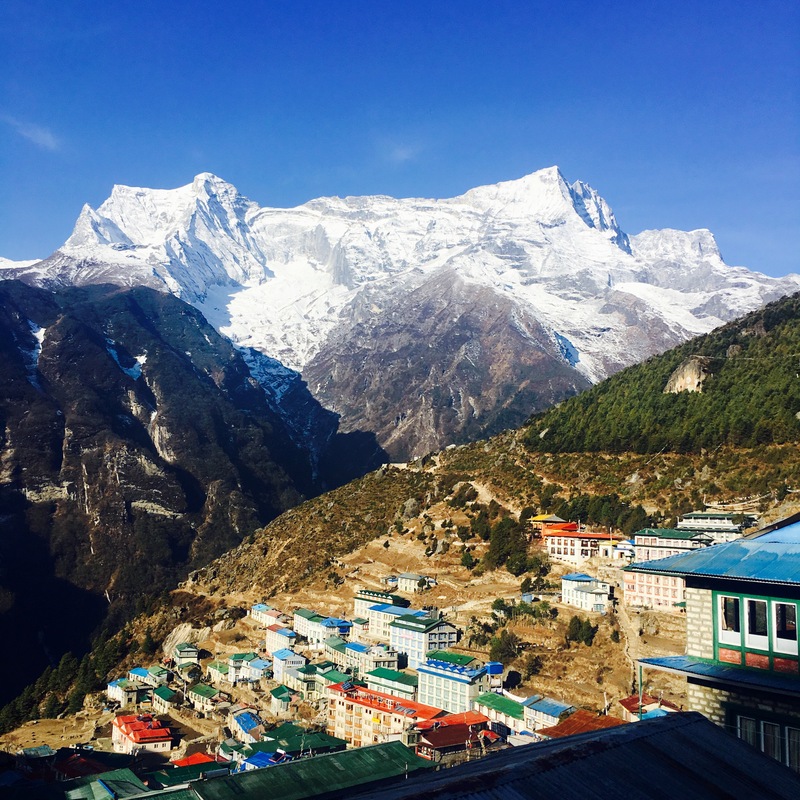 At 3,450 metres the brightly painted chalets of Namche Bazaar, sat under the sacred snow-capped gaze of Khumbila, provides a welcome hub of Alpine civilisation for weary trekkers. 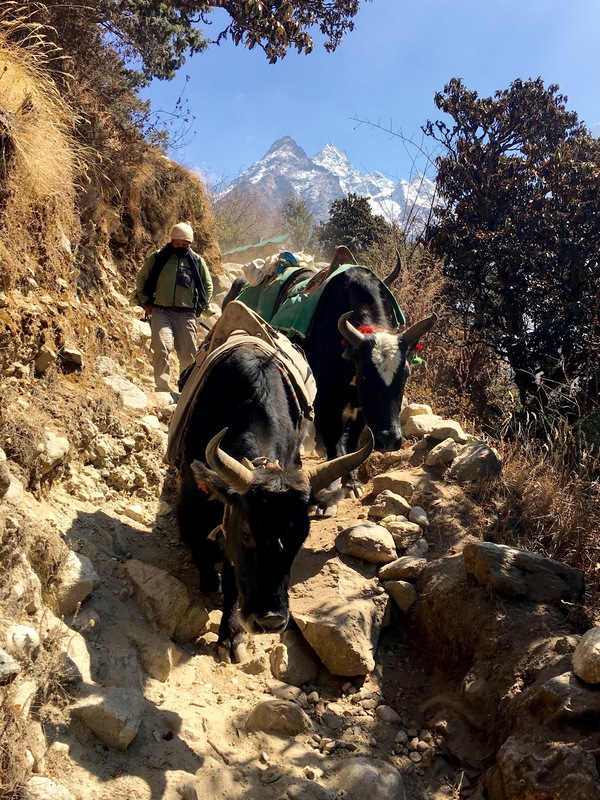 As the spring tourist season begins, yaks and donkeys carrying supplies up towards Everest Base Camp pass through the steep lanes while sherpas ferry huge laden woven baskets packed with everything from Pringles to flat screen TVs. For Westerners, bakeries, cafes, Internet access and mountaineering supply shops offer a last taste of luxury before the ascent upwards into the Himalayas. 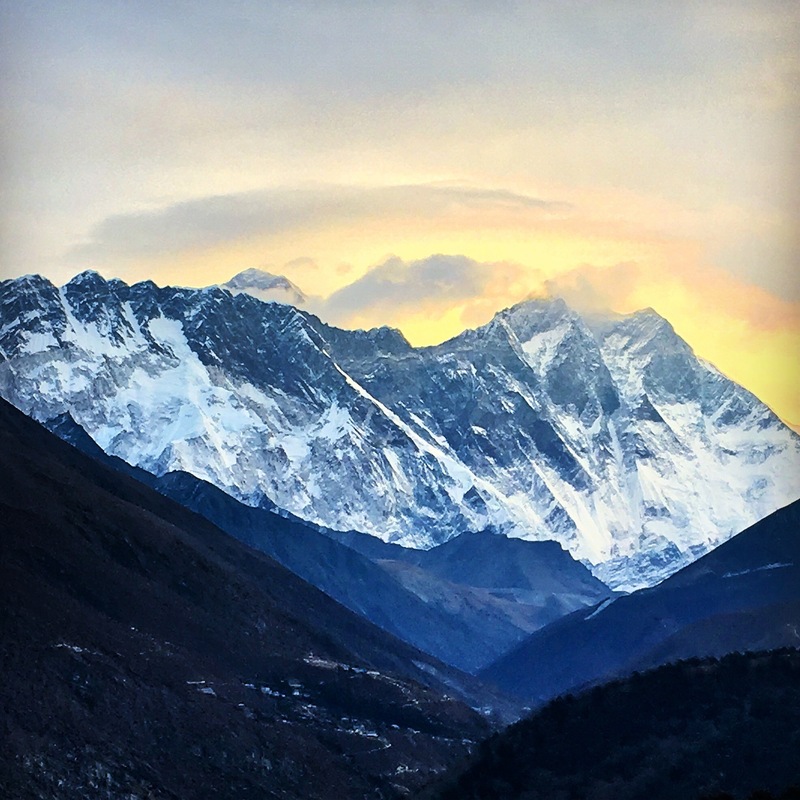 As the altitude climbs, the first view of 8,848-meter-high Everest, its icy summit just visible behind the twin peaks of Nuptse and Lhotse is afforded, a first reward on the third day’s ascent. 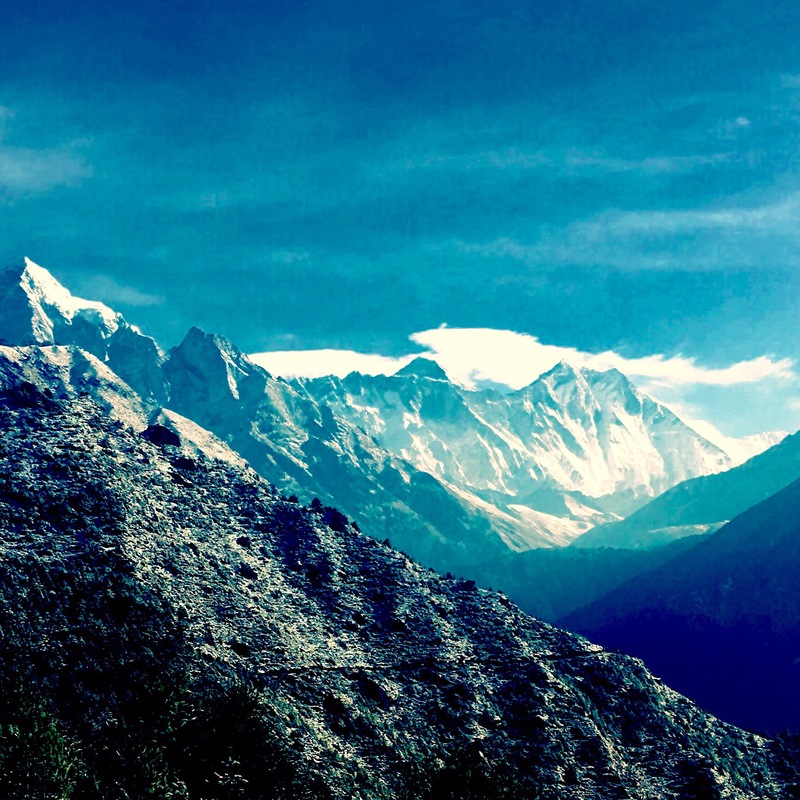 To the right, the steep sides of snow-capped Amadablam cut into the cerulean sky. 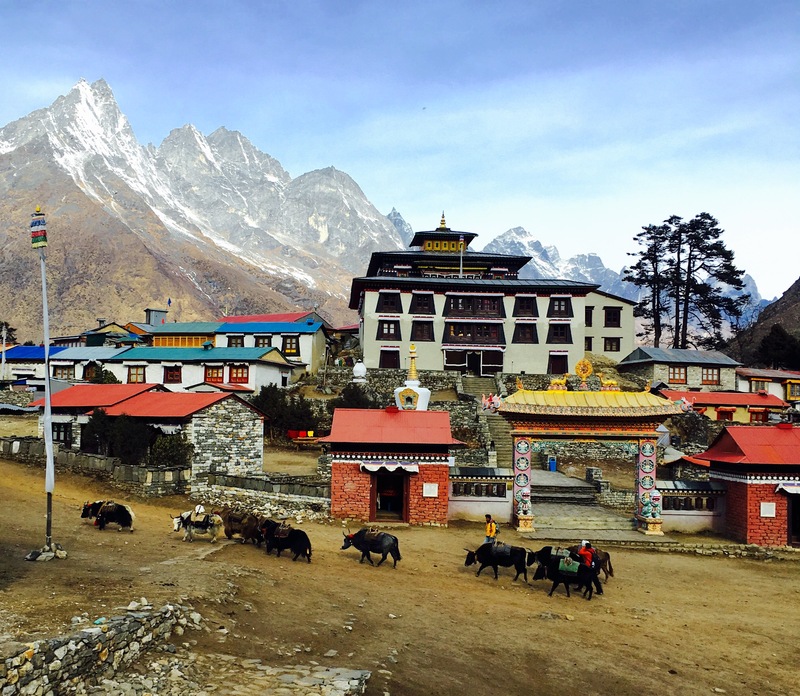 Golden-topped stupas and decorated prayer wheels mark the mountain pathways leading up to Tengboche monastery, the highest on earth, standing at just under 4,000 metres. This is the last view of Everest until Kala Patar, past the annually erected tent city of Base Camp, another four days trek away. 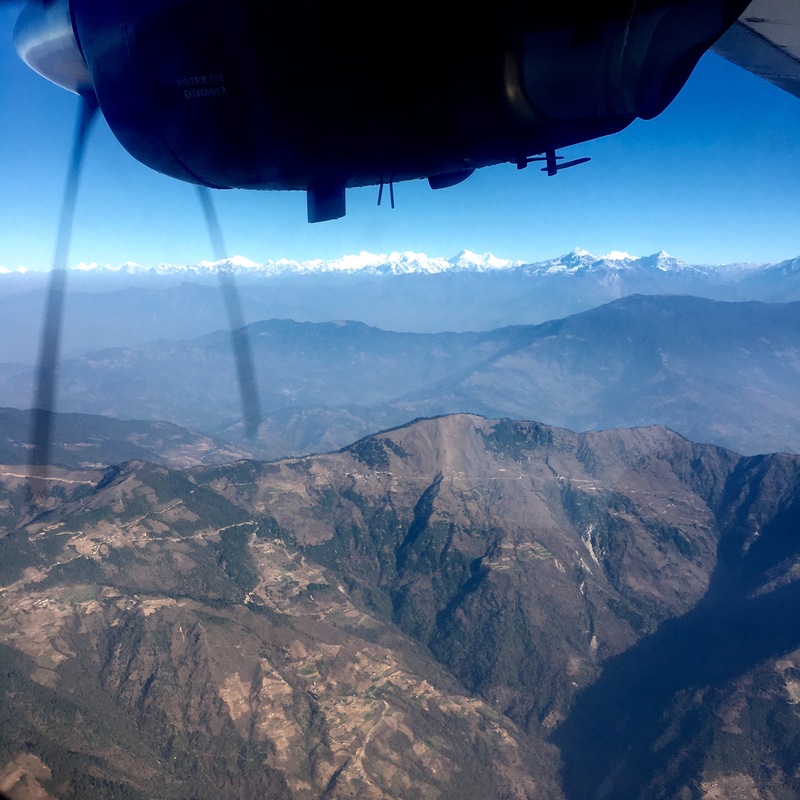 Yet for a lucky few, the hopes of scaling Everest’s heights will crystallise as the annual April to May climbing window opens. Viewed almost like a god for those in this isolated region whose livelihoods depend on it, touching its summit is indeed akin to something holy.